Eating healthy in the golden years is as critical as it is during childhood and adolescence. Because many older adults have a smaller appetite, it’s important that the foods they eat are rich in nutrients. 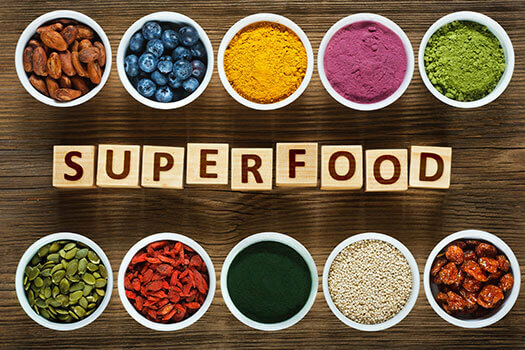 Encourage your senior loved one to include the following superfoods in his or her diet for good health. Tomatoes are extremely high in lycopene, a powerful antioxidant that has been found to reduce the risk of cancer, alleviate neuropathic pain, delay the onset of Alzheimer’s disease, and keep the eyes healthy. A study published in Life Sciences found that older adults who consumed foods with lycopene were able to slow or stop the progression of macular degeneration, a condition that causes blindness. Canned or processed tomato products such as tomato soup and tomato juice contain higher amounts of the potent phytonutrient. If your loved one has a difficult time chewing due to dental issues, yogurt is easy to eat but is packed with health benefits. Eating one cup of Greek yogurt provides 25 percent of the daily recommended value of calcium, 20 grams of muscle-building protein, and millions of probiotic organisms, which can strengthen your loved one’s immune system and keep his or her digestive system regular. Lentils are packed with phytochemicals, antioxidants that may prevent heart disease and cancer. Additionally, one cup of cooked lentils contains 369 milligrams of potassium. Potassium helps the body regulate its blood pressure levels and maintain a steady heart rate. Lentils can be added to a soup for a fiber-rich boost or used to replace half of the ground meat in everyday recipes. If your loved one is at risk for heart disease, having a daily bowl of oatmeal for breakfast may boost his or her heart health. One cup of oatmeal contains eight grams of fiber, four grams of which are insoluble. A study published in the November 2013 edition of The BMJ found that older adults who included more insoluble fiber in their diets had a decreased risk of cardiovascular disease. Helping an aging loved one manage a heart-healthy diet can be challenging. If you are the primary caregiver for a senior family member and you need respite care, Huntsville, AL, Home Care Assistance is here to help. Our respite caregivers are trained to assist older adults with a wide variety of everyday tasks, including meal prep, physical activity, and personal hygiene. We also provide 24-hour care and specialized care for seniors with Alzheimer’s, dementia, and Parkinson’s. Blueberries are a sweet snack that boasts a variety of health benefits. They contain more antioxidants than any other fruit found in North America and may boost brain health. A study done by researchers at the University of Cincinnati looked at the effects blueberries had on older adults with mild cognitive impairment. Those who consumed the equivalent of one cup of blueberries a day in the form of blueberry powder enhanced their memory and experienced an increased amount of brain activity compared to those who didn’t eat them. Red grapes and wine have long been known for their heart-healthy benefits. Balsamic vinegar is also derived from red grapes and can boost heart health. Balsamic vinegar contains polyphenols, which reduces inflammation in the body that can cause high blood pressure and high cholesterol. Additionally, balsamic vinegar contains a high amount of flavonoids known as anthocyanins, which have been found to protect arteries from free radicals. Chia seeds can absorb 10 times their own weight in water, which can help seniors feel satisfied after eating and prevent excess weight gain. Sprinkle chia seeds on yogurt or make a pudding for a healthy dessert. Seniors can stave off many health conditions by adding these superfoods to their diets. If your aging loved one needs help managing everyday tasks or encouragement to adopt healthier lifestyle choices, turn to Home Care Assistance, a leading provider of home care. Huntsville Home Care Assistance provides professional in-home caregivers around the clock to help seniors live longer, happier, and healthier lives. Call one of our friendly Care Managers at (256) 716-9940 to schedule a free in-home consultation.